All hail The Condor. Check out this video that Stew Johnson for put together for ESPN of Mat Hoffman breaking his own high air records on Danny Ways crazy ramp. This is a 3 part series and part 3 comes out tomorrow. 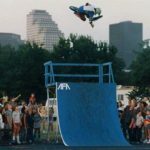 This entry was posted in Video and tagged Danny Way, ESPN, Hoffman Bikes, Mat Hoffman, Stew Johnson. Bookmark the permalink.